February 1st-2nd marks a confluence of several feasts and occasions including: the Celtic feast of Imbolc, St. Brigid’s Day, Candlemas, Feast of the Presentation, and Groundhog Day in the northern hemisphere! (Imbolc is August 1st in the southern hemisphere). As the days slowly lengthen in the northern hemisphere and the sun makes her way higher in the sky, the ground beneath our feet begins to thaw. The earth softens and the seeds deep below stir in the darkness. The word “imbolc” means “in the belly.” The earth’s belly is beginning to awaken, new life is stirring, seeds are sprouting forth. In many places the ground is still frozen or covered with snow, but the call now is tend to those very first signs of movement beneath the fertile ground. What happens when you listen ever so closely in the stillness? What do you hear beginning to emerge? St. Brigid is said to bring the first sign of life after the long dark nights of winter. She breathes into the landscape so that it begins to awaken. Snowdrops, the first flowers of spring are one of her symbols. On the eve of January 31st it is traditional to leave a piece of cloth or ribbon outside the house. It was believed that St Brigid’s spirit traveled across the land and left her curative powers in the brat Bride (Brigid’s Mantle or cloth). It was then used throughout the year as a healing from sickness and protection from harm. Often in Ireland, I have heard Brigid described as a bridge between the pre-Christian and Christian traditions, between the other world and this one. She bridges the natural and human world. 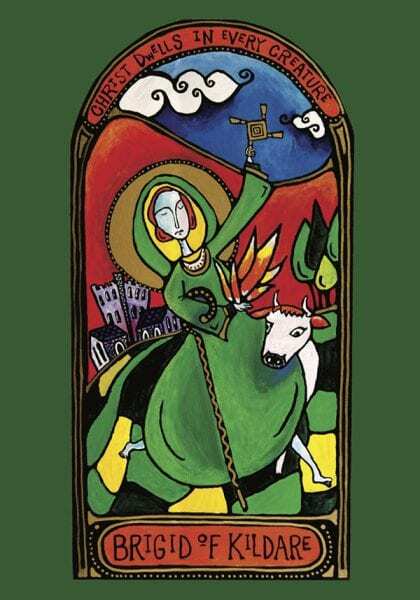 Brigid sees the face of Christ in all persons and creatures, and overcomes the division between rich and poor. Our practice of inner hospitality as monks in the world is essentially about healing all of places we feel fragmented, scattered, and shamed. One of her symbols is her cloak which becomes a symbol of unity. All can dwell under her mantle. The poem above is from my first full collection of poems titled Dreaming of Stones being published by Paraclete Press which you can pre-order and is available in March!